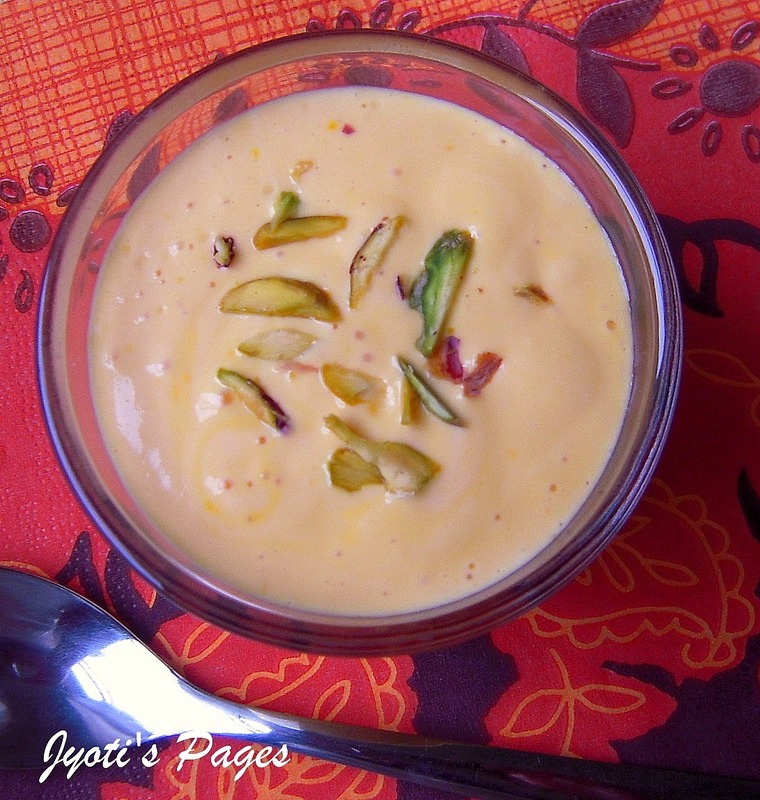 Shrikhand is a yoghurt based Indian dessert. It is creamy and flavourful and popular throughout India. Served chilled, it is definately a means to beat the heat. While traditionally, it requires some patience to make it as it is made from creamy strained yoghurt. Using Greek style yoghurt considerably reduces the time. Mango being in season, I decided to go for the mango flavoured one, Amarakhand ( Aam being Mango in Hindi). I have infused saffron in it for a enlivened flavour. Saffron is the world most expensive spice by weight. It imparts a distinct taste and colour to dishes. To derive the full flavour and colour of this spice, take a generous pinch of it in a small pestle and mortat and add a few drops of milk or water and rub it and use the resultant. See the picture below for an illustration. Be careful while handling it as it can give stains to cloths. A generous pinch of saffron rubbed with a few drops of milk. 1. Peel the mango and scrape all the flesh of it. Puree it in a blender. Seive to separate any fibre from the puree. 2. In a large bowl, add the greek yoghurt and add the mango puree. Mix till well blended. Add sugar as required. I needed only a tbsp. Add in the rubbed saffron. Mix well. 3. Scoop them in 4 serving bowl and garnish with sliced pistachios. Keep it in the fridge to chill. 1. Rubbing the saffron with a few drops of milk really brings out the colour and flavour. 2. If you want it creamier, add 60 ml of whipped double cream while mixing the yoghurt and puree. 3. Instead of Greek yoghurt, you can use hung yoghurt. Hang twice the amount, i.e. 2 cups of yoghurt in a muslin cloth over a bowl for 4-5 hours in fridge to get 1 cup of thick yoghurt. 4. If you do not like fruit flavoured yoghurt, try adding only cardamom, saffron, nutmeg and a combination of these. You can even try other fruits like peach, berries, apple etc. Linking it to Sameena's Mango Recipes Event and Kalyani's Indian Mithai Mela. Thanks for stopping by!! Cheers! 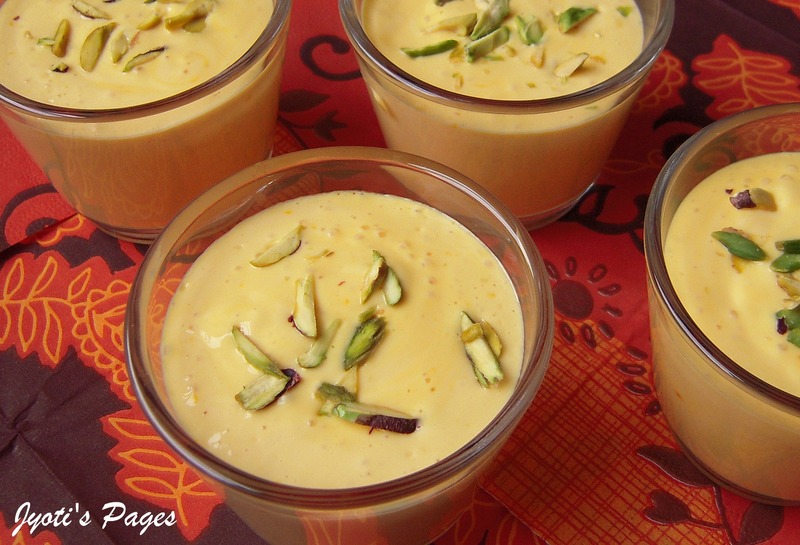 Yummyy...Had made this few months back minus the saffron..Was awesome and perfect for the summer. That is soooooo inviting!!!!! i tried ur pineapple chunky cake jyoti, it was amazing!!! yummy ! and what gorgeous pics!! This looks delicious, and I love mangoes. 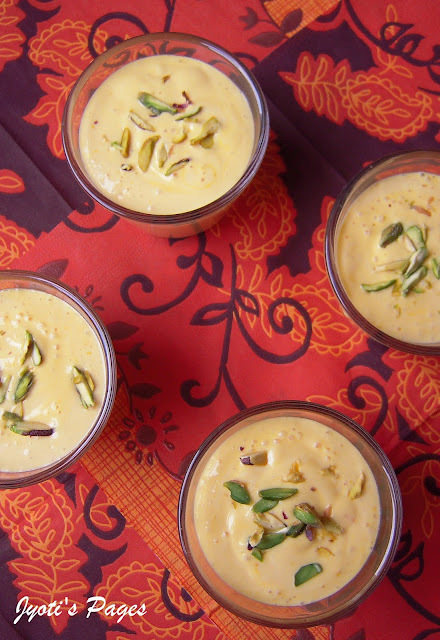 Wow, this mango saffron yoghurt looks very tempting, and definitely a delightful dessert. Lovely Jyothi.